On or off the beaten path? This thing called the ‘beaten path’ really isn’t such a bad place. But Italy also offers the possibility of going ‘off the beaten path’ and making your own unique adventure into the smaller villages and hill towns. Here you will taste local wines that aren’t sold anywhere else, discover the pride of recipes handed down through generations and marvel at places where indigenous craftsmanship and artistry still thrive. And you will feel the warmth and friendship of Italy’s sincere hospitality. Although it makes a convenient metaphor, the beaten path is not a fixed place. You can always find ways to leave it and come back during your Italian sojourn, as your fancy takes you. Here’s a quick guide, using some of our vacation rentals as examples. We consider the region of Emilia-Romagna one of the best places to visit for a rewarding departure from the beaten path. This is a place to explore hill towns with great vistas and enjoy world class food and wine. What a great way to explore the Chianti region, drive into Florence or spend the day in Siena! It’s easy to reach all the best beaten-path spots and then return home to you own private hill town away from it all. Groups from small to large are possible. It’s quite possibly the largest scenic terrace you will find on the Sorrento coast. An expansive view of Capri greets you when you walk out the door–seems close enough to touch. You feel away from it all here, overlooking the sea, but the beaten path is just minutes away if you want it. An affordable lakeside private house directly on Lake Como? How many of those might there be? This fishing cottage is cozy with modern amenities and it’s just far enough away from the crowded (and exciting) part of the lake. Go see the sights and come home to relax to the peace and quiet of a small village. Unique! 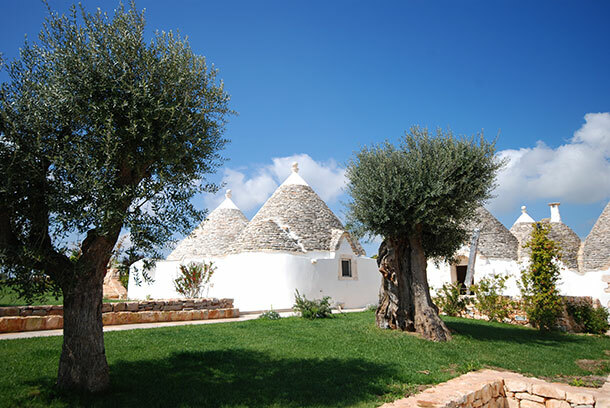 We still consider Puglia off the beaten path, even though its popularity is growing. Stay in a genuine ‘trullo’ house and get a taste of an unusual and photogenic medieval town. Great seafood and wine here! We could wander the medieval streets of Spello for days and never tire of its lofty views of the Umbrian valleys, its shops, its restaurants, its churches or its bright and beautiful flowers. Lunario’s location provides a private countryside feel, but the town center is just a moment’s walk away. Positano is a wildly popular beaten-path destination, but it’s still an accessible and fascinating place to explore. Its shops and beaches are world class, and its multitudes of paths and alleyways invite long walks. Perched above it all, Villa la Pistrice offers an invitation to see the town and return to a peaceful and accommodating vacation home. You wouldn’t expect Sicily to provide some of the most fascinating Baroque palaces, town squares and churches in Europe. That’s what makes the town of Scicli a great off the beaten path experience! It’s surrounded by homages to the Baroque masters who came here and built their treasures. This entry was posted in Amalfi Coast and the Islands, Emilia-Romagna, Italy up close, Puglia, Sicily, The Lakes of Italy, Tuscany, Umbria and tagged amalfi coast, italy tourism, italy travel, italy villa for rent, lake como, Tuscany, Umbria. Bookmark the permalink.